Banned Books Week is starting off with a bang, as we learned late Friday that Marjane Satrapi’s Persepolis faces a challenge from parents in the Three Rivers School District in southwest Oregon. At a school board meeting last week, one parent complained that the book contained language he wasn’t permitted to say before the audience, while another said she would pull her children out of school if they brought Persepolis home from the library. The meeting became heated as a board member who happens to work in the local community library system argued with speakers. Initially, parent Joseph Rice spoke during the public comment period to complain of “coarse language and scenes of torture” in the book. According to the Associated Press, the book is only available in high school libraries in the district, but even at that level Rice wants schools to require parental permission before students can read it. Board member Kate Dwyer, who is also a branch manager for the Josephine Community Libraries, interrupted Rice several times to say that he should make the entire context of the book clear at the meeting rather than just highlighting the portions that offended him. Board Chairman Danny York allowed Rice to continue, but stopped him a few minutes later “due to the language being read from the book.” Rice then asked why the book was allowed in school libraries if he couldn’t use language from it in the district office. After Rice was done speaking, Dwyer responded that the Bible also contains scenes of violence but she would not advocate removing it from a school library. But by now the focus was as much on Dwyer’s interaction with Rice as on the book itself. Several more audience members signed up to speak during the remaining public comment period and criticized Dwyer’s impassioned defense of the book. Parent Vikki Johnson described herself as “boiling mad” and told Dwyer, “You have your own opinions. Don’t put them on mine.” Johnson said that she would pull her three children out of district schools if they brought Persepolis home, although it’s unclear if any of her children are high school age and thus able to access the book in the first place. There were a few speakers in favor of the book, including high school student Sylvia Marr, who told the board “I don’t want to be sheltered.” An English teacher from the district also spoke up for Persepolis, pointing out that it’s on a suggested reading list from the Oregon Department of Education. Ultimately, no board action was taken at the meeting, since the challenge needs to follow district policy on Complaints Regarding Instructional or Library Materials. If Rice or other parents wish to pursue the restriction or removal of the book from a high school library, the first step is to submit a detailed two-page form to the librarian and principal, who will review the request with the complainant. Then, the district superintendent will appoint a staff review committee including a librarian. If complainants are not satisfied with the review committee’s decision, they may appeal it to the superintendent and school board. In preparation, Dwyer and the rest of the school board may want to take a look at our resource on How to Manage Challenges. Of course this is not the first time someone has tried to restrict Persepolis in a U.S. school district. Last March, Chicago Public Schools administrators abruptly pulled the book from some classrooms and initially said it was to be removed from school libraries as well. District CEO Barbara Byrd-Bennett quickly rescinded the library directive after an outcry from students, staff, and anti-censorship groups, but she said that the book contains “graphic language and images that are not appropriate for general use” and would not be allowed back in 8th-10th grade classrooms until teachers received additional training from district curriculum planners. 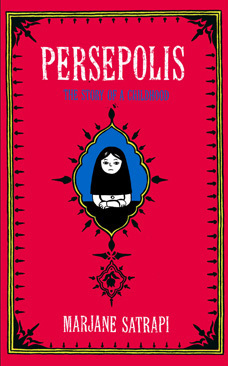 In the midst of that ordeal last year, the Chicago Teachers’ Union made the point that “the only place we’ve heard of this book being banned is in Iran.” This week, as we celebrate Persepolis and other targets of censorship, we can only hope that the Three Rivers School District does not become another shameful notch in that tally.